Watch the HD Trailer for The Box. 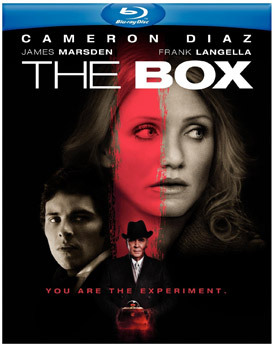 Cameron Diaz, James Marsden and Frank Langella star in Richard Kelly’s 2009 thriller The Box, inspired by the Twilight Zone episode “Button, Button.” View The Box movie trailer and Blu-ray special features below. A small wooden box arrives on the doorstep of a married couple Norma (Diaz) and Arthur Lewis (Marsden), who know that opening it will grant them a million dollars and kill someone they don’t know. MPAA Rating: (PG-13) for thematic elements, some violence and disturbing images.